S. Korean Prime Minister Han Seung-Soo delivers a congratulatory speech at a ceremony to mark the 2009 Taekwondo Day and the ground-breaking of the Taekwondo Park in Muju, S. Korea on Sept. 4, 2009. The event drew some 1,500 guests including 4 members of the International Olympic Committee. 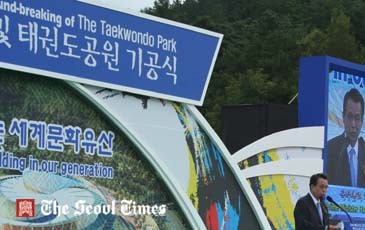 The Takwondo Park, which will open in 2013, will house the WTF-designated World Taekwondo Academy. The Taekwondo Park in Muju, South Korea, whose ground-breaking ceremony took place on Sept. 4, 2009, will house the World Taekwondo Academy, a global taekwondo education and research center designated by the World Taekwondo Federation. The Taekwondo Park, which will serve as the mecca of takwondo worldwide, is scheduled to open in 2013, with a total construction cost of $185 million. The ground-breaking ceremony drew about 1,500 people from at home and abroad, with the attendance of WTF President Chungwon Choue and Mr. Dai-soon Lee, chairman of the Taekwondo Promotion Foundation, which is in charge of the construction and operation of the Taekwondo Park. Among the dignitaries were Korean Prime Minister Seung-soo Han; Mr. Wan-joo Kim, governor of North Jeolla Province; Mr. Dae-ki Kim, the second vice minister of the Korean Ministry of Culture, Sports and Tourism; Mr. Yong-sung Park, president of the Korean Olympic Committee; and Mr. Sye-kyun Chung, chairman of the main opposition Democratic Party. The event, which took place on the 2009 Taekwondo Day, also attracted four members of the International Olympic Committee (IOC): Mr. Ivan Dibos from Peru, Mr. Phillip Walter Coles from Australia, Mr. Samih Moudallal from Syria, and Mr. Dae-sung Moon from Korea. About 650 taekwondo leaders, including 70 foreign taekwondo masters, attended the ceremony. Eight taekwondo grandmasters, who are over the age 70 and have served abroad over 30 years, received citations from the Korean culture, sports and tourism minister. 18 other taekwondo masters also received citations. Taekwondo Promotion Foundation Chairman Lee, who also serves as a vice president of the WTF, made a brief history of the Taekwondo Park project, followed by congratulatory speeches by Korean Prime Minister Han and North Jeolla Province Governor Kim. During the ceremony, VIPs wrote some congratulatory words on Korean paper to mark the occasion, which will be later inscribed on the cornerstone of the Taekwondo Park. The highlight of the event was when VIPs pushed the button to ignite the blast to break the ground for the Taekwondo Park. “On the occasion of the 2009 Taekwondo Day, I would like to offer my congratulations on the ground-breaking of the Taekwondo Park,” said WTF President Choue in a video-taped message for the participants in the event. “The World Taekwondo Academy, which will be located in the Taekwondo Park, will serve as an international academic center of the WTF for studies, education and research of taekwondo,” he said. On Aug. 15, 2009, an international symposium on the development of taekwondo curriculum for the WTA was held at the University of Berkeley in the United States. The results of the symposium will be presented at the 2nd International Symposium on Taekwondo Studies on Oct. 12 and 13, 2009 on the occasion of the 2009 WTF World Taekwondo Championships in Copenhagen, Denmark. “To meet the growing educational demands worldwide, a new educational system is required. That is WTA. WTA is an educational institute, where leaders from all social standings, students and professionals related to taekwondo spread taekwondo spirit and Olympic spirit, and study taekwondo philosophy,” said a participants in the symposium. The WTF designated Sept. 4 as Taekwondo Day at its General Assembly in Ho Chi Minh City, Vietnam in 2006, and has since marked the day. On Sept. 4, 1994, the IOC decided to adopt taekwondo as an official sport of the 2000 Sydney Olympic Games. In 2007, the Korean government enacted a law on taekwondo promotion and the establishment of the Taekwondo Park. On Sept. 4, 2008, the Korean government and the four taekwondo organizations, the WTF, the Kukkiwon, the Korean Takwondo Association, and the Taekwondo Promotion Foundation, jointly celebrated the Taekwondo Day.